Who doesn’t love stepping out of a warm shower or bath to be greeted by a fluffy, warmed towel? For most of us, a towel warmer in the bathroom is the ultimate in luxury. 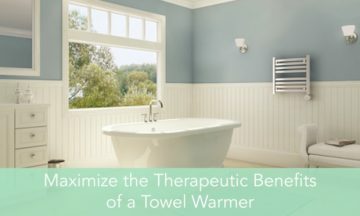 Believe it or not, there are actual therapeutic benefits of towel warmers that can help your mind, body, and soul. Several of my design clients suffer from allergies, sinus headaches, and everyday aches and pains related to stress and exercise. Towel warmers installed in their bathrooms, along with steam therapy, has proven to help them in more ways than they imagined. Take a look at these therapeutic advantages of a towel warmer and how it can be a small part of your health transformation. Warmth and steam rejuvenate our bodies in the morning and help us relax in the evening. Imagine heading out the door at dawn without a hot shower—when we have time to relax in the warm steam, we are energized for the day. A towel warmer mounted on the wall or a floor model next to your tub can prolong that bliss by creating a warm cocoon for your body after you bathe. They can also help dry your towels quicker after you’ve used them. With my design business in Florida, several of my clients dislike the humid climate here and how it takes hours for their towels to dry. A towel warmer is a simple answer to helping them dry quicker and can help dehumidify the air in smaller bathrooms. To help feel the therapeutic benefits of warmth consider pairing your towel warmer with steam therapy. I personally suffer from seasonal allergies and have been told by my doctor that steam and moisture can help decongest my head and keep my throat from being sore. I have found it to be so true! I guess that’s why taking a colicky baby into a steam-filled room helps them stop coughing, right? Steam therapy is not a new concept. In fact, it’s been around for hundreds of years, but homeowners are discovering that steam boxes can be built into their bathroom showers for therapeutic benefits. Steam can add moisture back into your skin while opening your pores and it can boost your metabolism and help you sweat out unhealthy toxins. Another added benefit can be achieved by adding aromatic oils into your steaming ritual to release the aroma into the air. Lavender can help you relax, and eucalyptus can help with bronchitis or asthma, the benefits of steam therapy are endless. Towel warmers come in a variety of styles and finishes to match the decor of your bathroom. Whether you prefer sleek profiles with minimal ornamentation or you like a classic style with an Old World finish, the option is yours. Many homeowners like the versatility of wall mounted models that are placed adjacent to the shower, while others prefer a floor model that can be moved throughout their home, or can even be used outside near the pool or sauna. Towel warmers are perfect for any home because they can run on a hot water closed loop heating supply or can heat up through a standard 120V household circuit. Choose whichever option works for your bathroom and can be installed by you or a contractor. Towel warmers are becoming more of a staple in today’s bathrooms as they offer a soothing way to dry off from a shower, but towel warming drawers are also perfect for towels that need to be kept warm on demand. This option is ideal for the elderly, or for physical therapy patients who need warm towels on an ongoing basis. Coupled with steam therapy, they can prove to be that added bonus to your therapeutic daily routine. Use these tips in your bathroom to see how you can start experiencing the benefits. Ronique Gibson is a home design lifestyle expert and architect who writes about décor and accessories for Home Depot. Ronique’s lifestyle tips related to bath towel warmers blends her architect’s eye with her expertise on design. Home Depot’s selection of towel warmers, which includes styles mentioned by Ronique, can be found on the HD website.